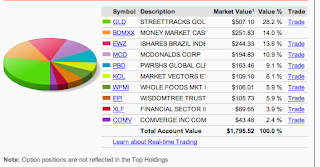 A few years ago, I opened a Sharebuilder account to test the waters on buying ETFs and individual stocks with my $50 or so a month of leftover savings once I maxed out my Roth IRA. Investing $50 here or there into stocks like MCD and GOOG gave me a little rush… as they were riskier than the index funds the remaining $5k went into every year. Since I opened the account in 2008, that account has amassed $53.6k in investments. I’ve watched the account lose 30% of its value during the great recession, kept investing at the market lows in stocks that seemed cheap, watched my account hit 25% profit, and return to 7%. Needless to say, my “for fun” stock and ETF account really has way too much money in it now to be “for fun,” but I’m not sure what to do about it. The worst performing by far is COMV, which is a small cap cleantech stock that has been all over the map. It’s doing really poorly right now so part of me is tempted to sell and part of me is tempted to wait and another part of me wants to buy more because based on my limited knowledge of the company, their history and potential, it seems like it’s cheap at the moment… and even short term it will probably move up again from where it’s at now. I don’t base this on any stock charts so really I don’t know. Shares are about $4.50 right now, my avg purchase price was $6.50, and I own around 700 shares. I’m probably most excited about AND, IHI, VWO and XLF. I wish I bought more WFMI for the long time it was doing poorly and my stock in it was down something like 60%. I really don’t own a lot of shares of any one stock… COMV with 667 shares is my largest ownership from a sheer number perspective. Next up in my list, XLF, with 281.7 shares. Then VZ at only 119.59 shares. Needless to say, since this is just my Sharebuilder account (not including my Sharebuilder IRA, my Roth IRA and Vanguard accounts, or 401k from my last company) I’m likely over diversified and making poor investing decisions. The way I look at it, though, is that at least I’m investing. It would be so easy to take that money and throw it away on a nicer apartment or other things I don’t need. At least in the stock market there’s a chance I’ll have some compound interest value on it over time. Then again, it’s extremely risky to put my money in the market this way… even though I am “buy and holding” I’m riding the same market that everyone else who is shorting and buying options and doing all those complicated investing things that I don’t understand in. So it’s hard for a novice like me to even understand what it all means, other than to put my money on as many spots on the roulette wheel as possible, and sit back as it spins. Is this a terrible investing strategy? Do you have any advice for me? My Sharebuilder account is down about $134 right now, and I doubt it’ll enter an uptrend anytime soon. The biggest burner is one stock pick – COMV – that I bought a measly 4 shares at for $29 a piece. Those shares are now worth about $10 a piece. Meanwhile, GLD, the “gold ETF,” which was actually doing very well a few weeks ago, is now “correcting” itself, and I’m down $30 on that investment. $30 isn’t bad, but I have a feeling that it will be a while before GLD hits $100 a share again. I think it will, one day, given that every so many years the economy looks bleak and people start to pour money into gold. I don’t know if it will ever go beyond that. I don’t know how long it will take to get there again. I don’t know how much money I’ll “lose” in the meantime. I see people saying GLD could be worth $70 a share or less. That’d be a “big” loss. I own about $500 worth – 5 shares. So a $30 drop per share would be a $150 loss. I guess that’s not that bad. If I want to hang on to GLD as a backup. It’s supposed to be “insurance” in a portfolio. Of course, most people say it should be in metal form, not paper. But GLD is kind of like owning the metal, right? It’s investing in the bullion anyway. I wonder if I should have sold GLD when it was up to $100 a share. I would have made a nice little profit of $47 at its highest… which would have been better than losing $300. Much better. I’m happy to hold on to all of my investments for many years. I’m trying to invest and then “forget” about my investments, even though I follow how they’re doing, but as soon as I put my money into that account I pretend it’s play money so I don’t have to worry about it. Maybe that’s an awful investing strategy? Regardless, I stopped investing in GLD. The $500 is enough of my portfolio at the moment to devote to that.